A project of Fort Bend County and the Fort Bend History Association, the DeWalt Heritage Center is the history hub of east Fort Bend County! In 2006, the historic Dew house was moved three miles down Highway 6 into Missouri City's Kitty Hollow Park. From there, it was renovated and transformed into the DeWalt Heritage Center and is now open on Sunday afternoons for tours and is available for community events! Proceeds benefit the educational programming at the DeWalt Heritage Center such as the children's summer history activities and the community Wassail event! Have items you'd like to donate? Donations of household items, decor and furnishings are needed for the DeWalt Heritage Center's annual Yard & Porch Sale! Donations can be dropped off at the Dew House every Sunday starting March 31 between 1 p.m. and 3:30 p.m. Note: No clothing, electronics or baby cribs/car seats, please. For more information, please email Diane Ware. ​Become a Dewcent! Our dedicated volunteers give house tours, organize community/educational events and help keep East Fort Bend County history alive. For more information about how to get involved, email Diane at dware@fbhistory.org. Open on Sunday afternoons from 1 p.m. to 4 p.m.
(Except holidays.) Admission is FREE. Bring home a little piece of history this holiday season! 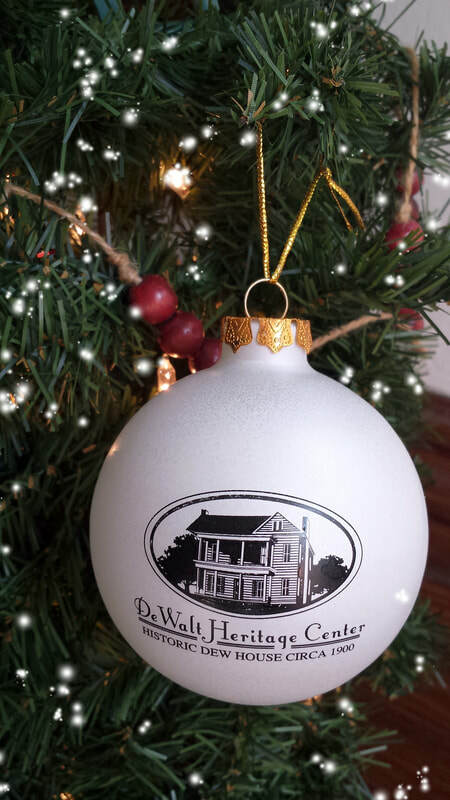 Purchase the DeWalt Heritage Center Christmas tree ornament and help preserve east Fort Bend County history! The DeWalt Heritage Center is a special project operated by the Fort Bend History Association.